Why buy a hutch in the first place? 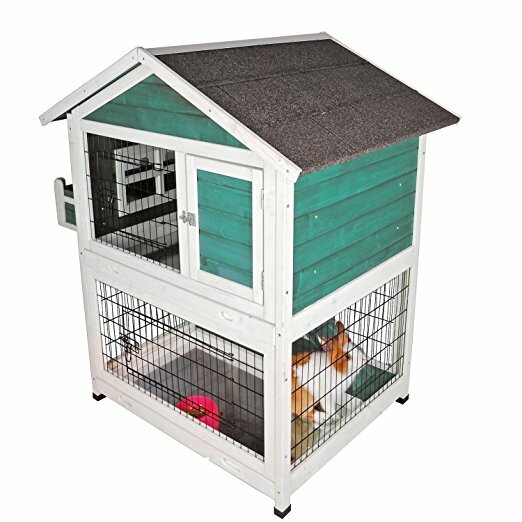 Primarily, hutches are important for the safety and comfort of your rabbit. By providing them with an enclosure that will keep out possible predators and provide them with a warm place to stay during inclement weather will help ensure that your rabbit lives long and healthy. This guide will help you decide which hutch will work best for you and your new friend. 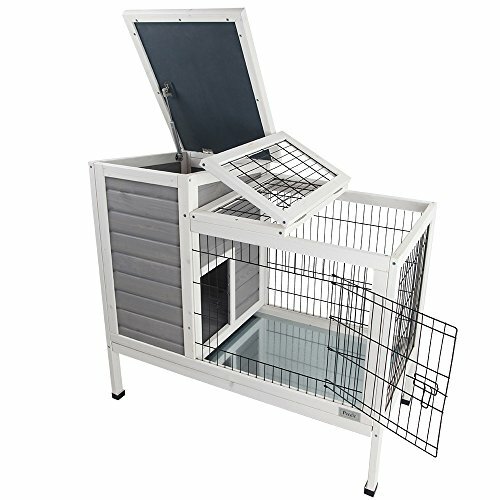 This high quality and affordable hutch is perfect for an outdoor pet cage setup. The upper story of the hutch is tightly enclosed and offers easy access for both you and your animals. The lower story can be set directly on the ground outside so that your animals can sit directly on the grass. Both stories come with openings for you to access the inside of the hutch. If you have more than one pet and they require separation, there is an included divider for the upper living area to create up to two rooms. There is a small ramp from the lower story to the upper story to give your animals a wider sense of movement. The hutch does require assembly and measures 40″L x 21.9″W x 39.2″H and weighs around 40 lbs when assembled. Merax offers two primary designs for its small animal wooden cage: a rabbit hutch with two stories and a chicken coop style with open access to the ground. The rabbit hutch consists of two hutches stacked together with a slip-free ramp running between them. Both levels include easily removable floors for quick and easy cleaning. The roof of the hutch is made with asphalt shingles which gives it a stronger weather and damage resistance, and the striped wooden planks are both waterproof and bite resistant. The hutch measures 48″L x 19.7″W x 41″H and weighs around 42 lbs fully assembled (assembly is required). Good for rabbits, guinea pigs, chickens, ducks, etc. This handsome rabbit hutch features a grey hutch design with white trim and three wire walls. There is an inner sleeping area that opens up into a larger run area. Both areas can be accessed via roof hinges. Both areas also include removable floors for easy cleaning, though the hutch does not include a grate for the inner housing. Petsfit has created a visually pleasing indoor rabbit hutch that will work well for small to medium sized animals. The hutch measures 36″L x 20″W x 30″H and is easy to assemble. 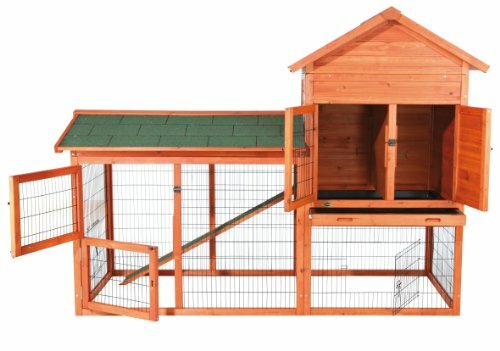 An alternative option to their indoor hutch design, Petsfit offers this outdoor version at a slightly increased price, but with plenty of interesting and useful amenities to make the investment worth your time. The entire turquoise cedar construction is painted with water-based paint which is non-toxic for your rabbit. The large entrance area and two=story design gives your rabbit (or other small pet) an upper, enclosed living space and a lower running space that will allow your rabbit to feel the grass between her toes. Assembly of this hutch is quick and easy and measures 42.5″L x 30″W x 46″H. Fully assembled, the hutch weighs around 79 pounds. 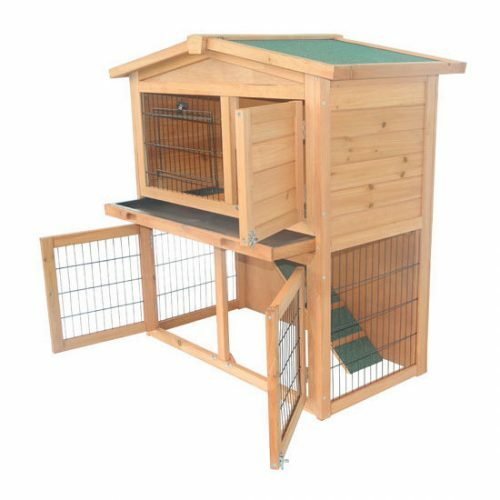 The hutch is solidly constructed and resembles a mini condo for your furry friend. 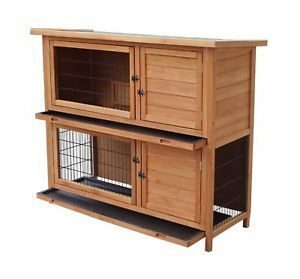 This hutch is both visually pleasing and large to give a single small animal plenty of movement room or ample room for more than one small animal to explore. The fir wood construction is highly durable and 0.4″ thick all the way around. The hutch is painted with waterproof paint to keep it dry and last longer. Between the upper and lower levels of this two story hutch, there is a no-slip ramp for easy access for your pets. The hutch measures a total 48″L x 25″W x 36″H and weighs at around 33 lbs when fully assembled. There is an easy to remove tray beneath the upper level enclosed living area for easy cleanup and easy hinged access to both levels. 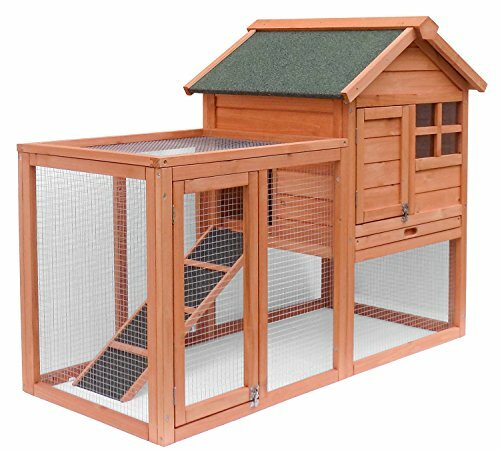 This large hutch is an ideal outdoor animal enclosure option that is designed around an upper, enclosed level for your pet to sleep safely and comfortably and a lower, open level so your pet can run across the grass. The upper level has a removable plastic tray for quick and easy cleanup and a small attic that can be used for storage of supplies, etc. The glazed pine finish is visually pleasing and the overall construction is durable. The hutch measures 78.2″L x 37″W x 57″H, making this a large hutch with enough space to fit a larger rabbit and/or multiple small animals. Fully assembled, the hutch weighs around 130 lbs. There are some key features you should keep an eye out for when it comes to choosing the perfect rabbit hutch for your home or yard. Not all rabbit hutches are made the same, and it is worth your time and money to figure out which one are made the best before you make your purchase. Although these hutches are made for small animals, it is a good idea to make sure that you purchase a hutch that is large enough for your pet to move freely and with a considerably higher degree of freedom. Make sure that you carefully measure what the ideal inner dimensions of a rabbit hutch are to fit your rabbit (or other small animal). If you have more than one rabbit, then plan accordingly. This hutch is where your rabbit will spend most of its time, and it is important that you make its life and home as cozy as possible for their maximum quality of life. The general rule of thumb is to make sure that your hutch is at least four times the size of your rabbit and is tall enough that she can stand on her hind legs. Do you want an indoor or outdoor hutch? Deciding this will help you determine how much you need to spend on higher quality materials. For instance, if you are looking for an indoor hutch, then predator protection and waterproof siding will not be as important. But clean up is likely a bigger issue, and you do not want a hutch with siding that allows for rabbit droppings or bedding to escape through large wire holes onto your floor. For an outdoor hutch, you will definitely need to make sure that the siding of your hutch will protect your rabbit from inclement weather and/or predators. Also, with an outdoor hutch, you have the option of looking for a style with an open floor so that your pet can run around in the grass for extra fun playtime. You will want to make sure that your hutch has ample space at its openings and doors to allow you to be able to reach in so that you can more easily access your rabbit. This is usually required for cleaning times or if you are transporting your pet to a carrier to take it to the vet and/or to a larger run area for some extra exercise. These doors and openings should also have sufficiently strong and functioning latches so that your rabbit remains secure. These latches prevent your rabbit from escaping and prevent predators from invading the hutch and hurting your pet. When it comes to comfortably and securely housing your rabbit or other small animal, choosing the right hutch is a crucial step so that you can make sure your furry friend lives a long and healthy life. Making a good investment now in a quality hutch will prevent you from having to spend more money over the long run with multiple, inferior hutch purchases. Do away with the guesswork and find the rabbit hutch that will efficiently serve your needs and create a happy home for your small pet.